The following inventions have been patented this week, as will be found by referring to our List of Claims on another page:— COTTON PRESS.—The object of this invention is to obtain, by the most simple means, a press that may be operated with the least possible degree of friction, and that will have a progressive or variable power, so that the power is increased and the speed correspond- ingly decreased, as power is required," and the speed increased and power decreased as less power is wanted. Provision is also made for the adjustment of the plungers or followers, so that the relative working distance between them may be increased or diminished as required. These objects are attained by the peculiar arrangement of a system of levers, which without diagrams we could not render intelligible. Sufficit to say that it is a simple and good press, and was invented by Eugene Duchamp, of St. Martinsville, La. EXPANDING REAMER.—The reamer is a tool for enlarging a hole already made in metal or other material, and is in general use among mechanics. J. Greenhalgh, Jr., of Burville, E. I., has invented (and assigned to Joseph Greenhalgh, Sen., and D. T. Howard, of Blackstone, Mass.) a new expanding reamer, which consists of two cones so arranged that they will send out the strips, which work in slots, and carry the cutting edge, both at the top and bottom equally, or at an angle, the one to the other; another improvement is in combining a drill with the reamer. MACHINE FOR SPLITTING BOOT AND SHOE PEGS.—Abijah "Woodward, of Keene, N. H., has invented a machine for this purpose, the object of which is to give a positive feed motion to the block or bolt from which the pegs are split, so that the bolt may be moved precisely a certain distance at each upward stroke of the knife, and bo in a proper position each time the knife descends upon the bolt to perform its work. The several parts comprising the feed movement are arranged so that the block cannot be moved accidentally or inci-" dentally. The arrangement also allows the adjustment of the feed roller to suit bolts of varying thickness without at all affecting the proper feed motion. COTTON BALE HOOP.—It has long been a desideratum with the cotton-planter and merchant to secure a hoop for baling cotton which would answer all the ends of the hemp cord, and yet be free from that destructible combustible nature possessed by hemp, and which, when the bale takes re, facilitates its destruction instead of retarding it. Several plans of metal hoop have been patented and brought before the public of late; and while these go a great way towards answering the main end in view, and woud, if adopted, retard the destruction of the cotton bale by fire, they for some reason have failed to warrant and induce a universal abandonment of the combustible hemp cord, and the substitution of the metal hoop therefor. The present improvement appears to be peculiarly adapted for the purpose intended, as it is simple, neat, cheap, and durable, and not at all liable to get loose at the lock-joint, there being no pin, loop, or other holdfast beside the lock formed on the ends of the metal hoop. 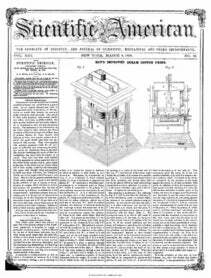 It is the invention of John McMurtry, Lexington, Ky. LIME KILNS.—This is an improvement on a lime kiln patented by Powell Glfefcom and Charles S. Denn, of Baltimore, Md., on Nov. 17, 1857. The present improvement consists in dividing the oblong stack ajnd basin claimed in their former patent into two chambers, by means ef a central partition, and furnish-j ing the oblong furnaces with side feed doors, I thus dividing the stack, and providing two draw .pits through which to withdraw the lime after it has been burned. It also increases the draft, and allows a much larger ! kiln to be used without at all affecting the even settling of the lime. "When but a small quantity of lime can be sold, only one chamber may be employed, and then when the sale is more brisk, both chambers may be used ; and the quantity of lime burned and kept on hand thus regulated according to the demands of the market; and by making the side draft flues answer as auxiliary furnace doors, the fuel can be introduced in a manner to keep up a uniform heat from end to end of the furnace chamber. This is a good kiln, and may "he ) seen in practical operation on a large scale in Baltimore, Md.